Jim Morrison led a life of excess and mystery so it’s only fitting that he drove an extravagant car to match his superabundant personality. It’s also fitting that his Shelby GT500 disappeared in 1969, never to be seen again. Rumor has it that Electra records bought Jim the Nightmist Blue 1967 Shelby GT500 for the work done on the self titled debut album by The Doors. One story explaining the cars disappearance had Morrison hitting a telephone pole on the way to the Whisky-A-Go-Go. Frustrated, he walked the rest of the way to the club and either never returned to the accident scene or never followed up with the towing company. Another story had him parking the car at Los Angeles International Airport where the car was left for a long period of time while Morrison traveled. Upon his return the car had been towed and sold at public auction. 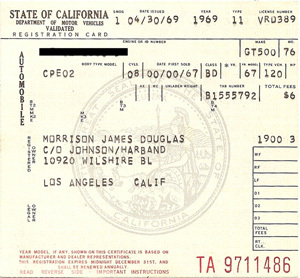 What does survive is Morrison’s registration card and footage of Morrison driving his Shelby hard through the desert in an experimental film shot in 1969.